The exhibition entitled "And I Still See Their Faces. Photographs of Polish Jews" is an initiative of the Shalom Foundation, which in 1994 launched an appeal for people to send in any photos they hadof Polish Jews taken prior to the Holocaust. They began to get pictures from the most diverse places from Poland and the farthest corners of the world. Some of these photographs have been kept as precious memories, others were preserved in forgotten corners, relegated to attics and basements. This exhibition can be interpreted as a lament for a vanished world, which can only be remembered by watching old photographs. Museums in several countries preserved photographs of famous Polish Jews: musicians, painters and writers. But it lacked the memory of the common people, usually ignored by History. With this exhibition, the Shalom Foundation has recovered this memory. Thus, we have been able to preserve the names of that people and today they are part of the collective memory of Europe. "The Righteous are those who have saved one life. This title is also deserved by those who saved the memory". Those are precisely the ones who have actually made possible this exhibition. 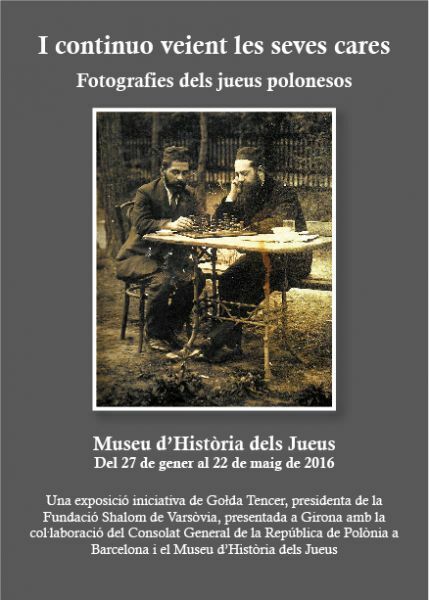 An exhibition of the Shalom Foundation presented in Girona with the co-operation of the General Consulate of the Republic of Poland in Barcelona and the Museum of Jewish History.